Operating since 1936, VKN Jewellers was established by Mr. Yuvabalan Sivasamy’s dad and is currently being prolonged by Mr. Yuva himself, with the assistance of his wife and son. VKN Jewellers operates from 10am till 8.30pm by the Sivasamy family, with the help of a few employees. 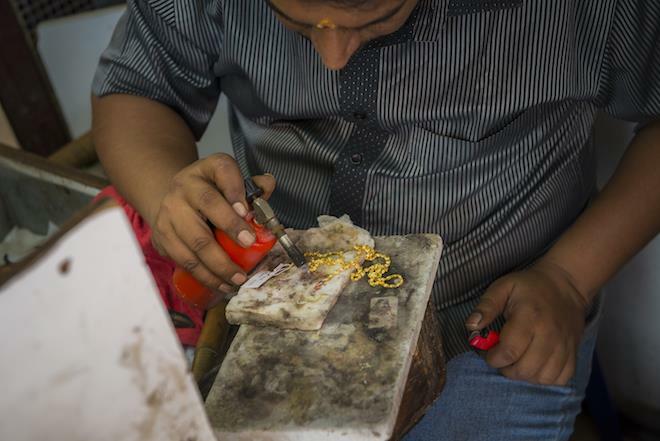 At VKN Jewellers, other than producing gold jewelleries, they offer services on repairs and remodelling too. Each piece of gold comes in a different size and weight. A large number of their customers will bring along their own preferred designs, requesting for replicas. If you’ve not got a design in mind yet, there are samples for you to choose from, or they’ll be able to create new designs in store. Other than their usual daily orders, VKN Jewellers receive regular orders for weddings, naming ceremonies, birthdays and anniversaries. There is a huge collection of gold items at VKN Jewellers, ranging from gold watches, necklaces, bangles, earrings, rings, nose studs to ornaments of all sorts. The highest quality of gold sold here is the 22 carats 916 gold. On items made with gold of this grade will have ‘916’ carved on the gold pieces. The items made and sold here are mostly of South Indian styles. That being said, jewelleries of other styles can also be made at VKN upon request. The Sivasamys are very particular in the designs and shapes of each end product. It is of their utmost importance to ensure that each piece of their product is carved neatly and beautifully. Usually, heavier designs, for example necklaces, are made with the help of machineries, and simpler designs such as rings are carved by hand. In Indian culture, gold is deemed as a religious and cultural asset. It carries the meaning of prosperity, ancestral and beauty. It is the norm for men to wear gold jewelleries, for example earrings and bracelets as a symbol of bravery. As for Indian women, Thaali (a necklace given by a Hindu groom to his bride to signify her as a married women) is the most important jewellery for Indians is worn as a symbol of their marital status. At VKN, orders for Thaalis are taken very carefully and treated with respect. 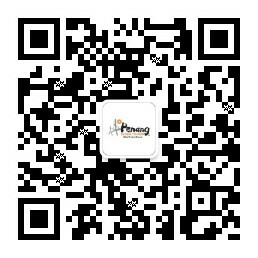 It is important to ensure that these orders are made according to customers’ tradition and request. It is believed that Thaalis must be made on auspicious days in order for the couple to have a blessed marriage. In the past, Indian women used to wear their Thaalis with a yellow thread, but now, Thaalis are worn with a gold chain. 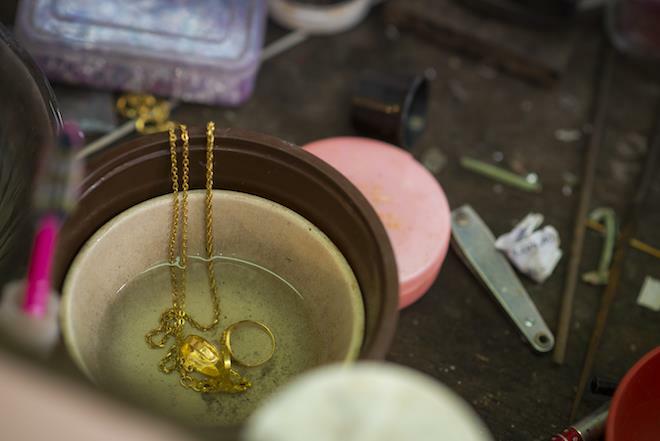 The process of making gold can be lengthy and tedious. To start off with, the gold pieces has to be melted and put into strips according to the required sizes. Next, the strips will be knocked and shaped into its required design. And after, the surfaces will be smoothened before the process of engraving can start. Before it is ready to be sold, the designed pieces will be polished either by hand or machine, making sure the highest quality is being presented. 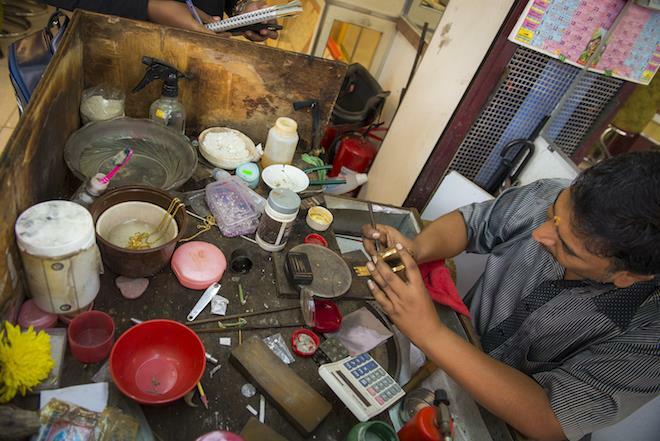 At VKN Jewellers, the Sivasamy family employs a small number of staff to assist them. Most of their employees are from India, with only a few who are from Malaysia. 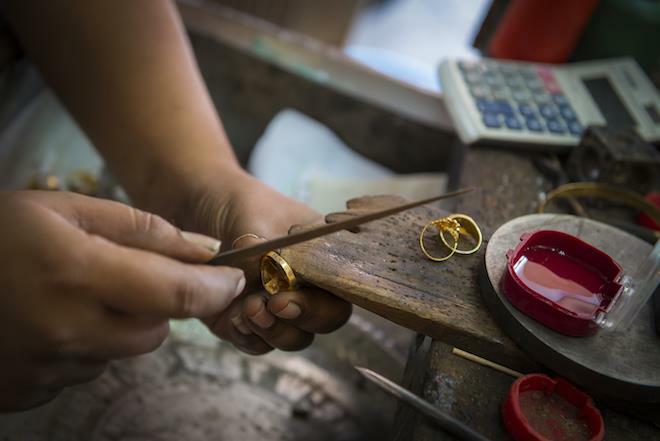 Other than producing, repairing and remodelling gold items, they can also polish your items, and perform nose and ear piercing. 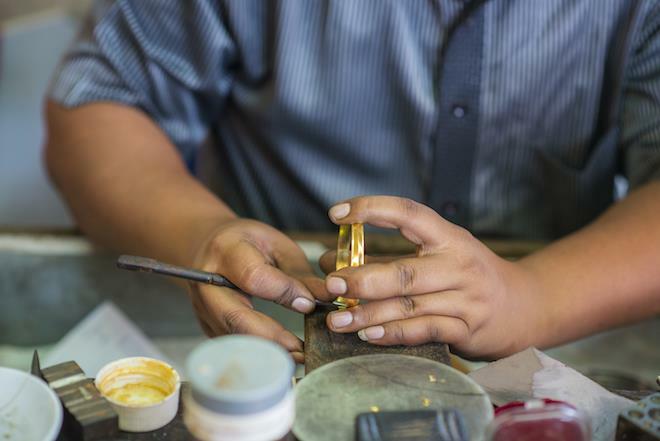 When asked, Mr. Yuvabalan reiterated that the criteria to be a good goldsmith is for one to be trustworthy and honest. Any bit of covetousness is sure to jeopardise the business. To maintain a positive and cheerful atmosphere, they practise a welcoming tone towards all their customers, giving them the best possible. VKN receive customers of all races and religions where there are also many who are their loyal customers. Business at their shop flows steadily each day with a reasonable amount of sales. Drinks are always served to all customers and as a token of appreciation, they present umbrellas and bags to customers who makes a purchase at their shop.